I had some trouble finding these today. The trick is this - once you've gone right in the first canyon, past the crocodiles, hug the outside wall/path on the map . This will get you to the far bottom right corner of an atlas map where these can be found. Does anyone know where the deviate dreadfangs are? These are the only ones I can't find. So I found the entrance to WC in the Barrens, worked my way to a large area with a lot of water in the center with Deviate Stinglashes, but no Deviate Dreadfang. There is an entrance to the instance there, but once entering, I don't see another Windserpent. I worked my way to the end of the instance, all the way to the entrance again, out into the Barrens, then back to the very end of the instance, killing all the Druids of the Snake (or whatever they're called) until I hit the very very end. I'm trying to tame this monster because of its unique dark blue skin, but haven't found it yet. I'll post back here if I ever figure it out. Please post if you know where it is. Alright, after you go through WC for a while and after you enter the instance you'll find a large circular cavern with a river running through the center (and a bit below). I turned left and followed the river, that's why I couldn't find this monster. If you turn right and follow the water, you'll go past some waterfalls and fight these living plants. Keep going in that direction and you'll eventually come across these monsters. I don't know anything about what pet is best, but I must say that the skin for this monster is very sharp looking. As far as looks go, this solid blue windserpent probably looks the best of all. I think that the only color that could possibly look cooler would be solid black. But, I don't know of any black windserpents in the game so far - come on Blizz, hook me up! I think this is the best pet for hunters 22-29 they have a great DPS and they have good strength and stamina. These mobs are not rare, they are just far back in the instance, past Lord Pythas, near Skum. They are blue windserpents, and they are often grouped with Druids of the Fang, though there seems to be some solo pats. As an above poster said, jump into the river and hang a right, follow this path until you find them. It will take a while to see them, but if you keep going this way, eventually you will. this or a cat for pvp and pvp? Windserpents are probably the most useless pet I've ever used. No armor, mediocre attack. Basically a tank pet without the armor. That said, I love them. Dependsing on the lighting and monitor settings, this baby can appear anything from inky blue to a bluish brown or black. I'm keeping one as my DPS pet, gonna raise the sucker around level 60. Yay for color schemes you can't get anywhere else! Hehe this is my most favourite pet in the game so far, I'm lvl 28. 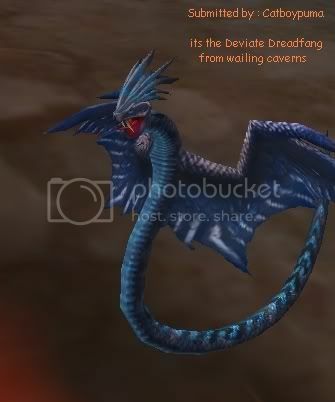 Tamed Deviate Dreadfang when I was level 21, took ages to find. Named it ElectroCute! Hehe. I love the fact that it can change a variety of colours from the light around - in dark areas it is dark green, light areas its blue. Its so gorgeous and does a lot of damage, being BM specced it is the best pet for me! <3 IT! What a beauty! I just tamed this little darlin at level 42, so I definitely have my work cut out for me. This picture really doesn't do it justice - I keep catching myself staring enthralled at my own pet! I've already gotten so many compliments on it. The colors look just like a dusky sunset, so I named mine Eventide. I was searching for a blue pet. I had the yellow thunder one from Camp Taurajo. And once I saw it I fell in love. I had been looking for a good blue pet and I couldn't have been happier. reason for my blue pet obsession: my favourite colour is blue. even my character's name is a shade of blue. Just tamed one of these at level 43 as my secondary pet. After about 20 minutes in Stranglethorn Vale, he's up to level 23 from 21. Haha...this'll be a fun next few days getting him up to speed :) My fault for waiting so long to get him, though. Weeks back, I saw a person run through Ironforge with, what I thought, was the most awesome Wind Serpent I had ever seen. (Of course, it was this one, though I didn't know it at the time... :-/ ) Immediately, I sent a tell to them and asked where they got it. Sure enough, I checked this site and immediately fell in love with it yet again as soon as I found the pic. I immediately set out for the Barrens, which was only a hop, skip, and a jump away, ignored every single enemy in the instance, and got myself lost several times, but I was determined to find one. And eventually, much to my satisfaction, as soon as I saw the name 'Deviate Dreadfang' on the mini-map, I lunged towards it, used a Freeze Trap, and tamed it easily. Ya... there are no level 15s... There are only 20 and 21s, and those are inside the instance. Anyways, to get to em go down into the water and then head east, then keep going up further and further, you start seeing em half way up. Anyways, ya as a Night Elf, who took a good hour and a half to get there and find out there are only 20+s, I'm pretty damn pissed. Why does this site retain outdated info like this... can cause people alot of unneccessary trouble. I'm not sure where the entrance to WC is. I think it is around the xroads, but where exactly is the entrance. Or, would anyone have the coordinates? I have Arikara right now, and other than the puff of smoke (ONLY when you summon her) she is not my fav in colors. I saw this guy in person one day with another hunter and the color is really nice, even soothing. I just might let arikara go back home and try for this guy.